ages 7 months & up! 2018/10/23 The KUMIITA Beginner Panel Set and Carry Pouch are Now on Rakuten. 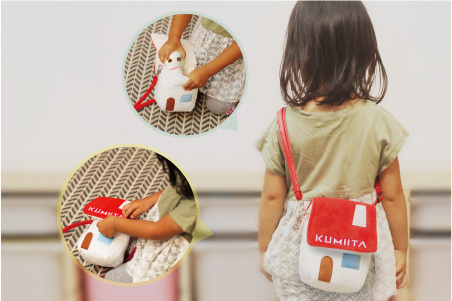 The KUMIITA Beginner Panel Set and Carry Pouch are Now on Rakuten. 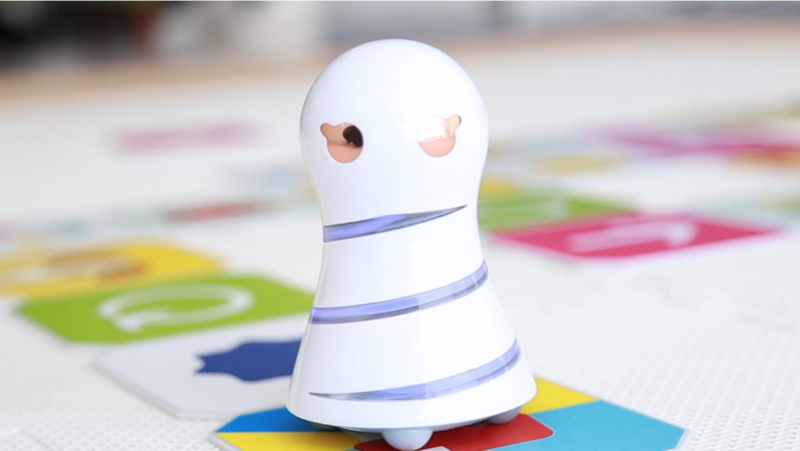 KUMIITA was born with the idea to have children all over the world know the fun of programming! 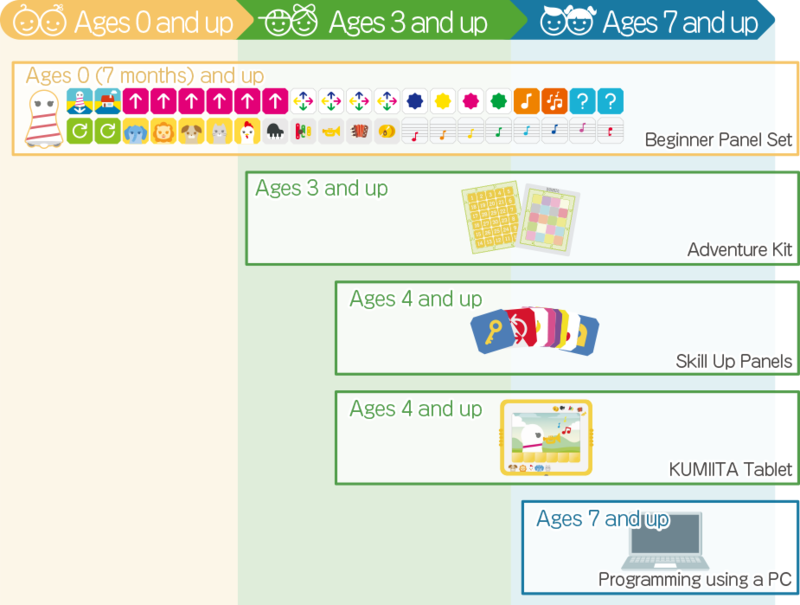 Imaginative ways to become familiarized with programming are abound as children play and have fun with KUMIITA Unit and the KUMIITA panels that incorporate learning elements like sounds, pictures, colors and actions. 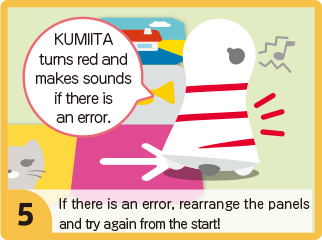 KUMIITA's basics are easy! 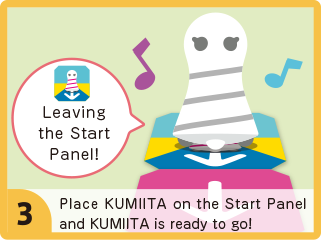 Arrange the panels to make your own course and set KUMIITA Unit on the Start Panel. That's it! 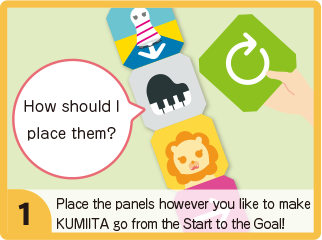 While easy to play, the point is how to arrange the panels so KUMIITA Unit reaches the goal. Be it a simple arrangement or a complex one, there are so many routes you can take. The Beginner Panel Set comes with 40 panels in 30 panel varieties. The panels have pictures on them with matching program data that KUMIITA Unit reads and then executes. Here we go! The adventure starts with the go signal! With the start tone, KUMIITA Unit will move in the direction of the arrow. KUMIITA Unit loves reaching the goal! KUMIITA Unit plays a fanfare, blinking blue, red, green and yellow. KUMIITA Unit moves in the direction of the arrow. Enjoy the adventure arranging panels where you want KUMIITA Unit to go. 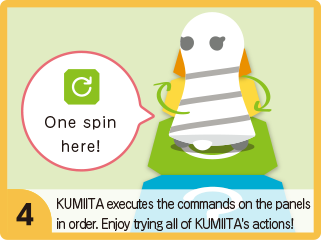 KUMIITA Unit spins clockwise one time and moves happily on. 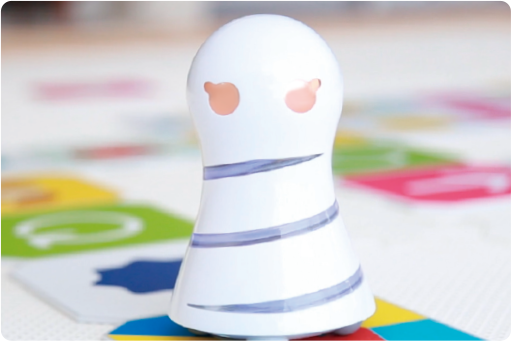 KUMIITA Unit moves in the same direction as the color of its stripes. Try arranging the panels to have KUMIITA Unit go different directions. A mysterious panel that chooses a Color Change, Instrument or Animal Panel.What will happen? Try it and find out! KUMIITA Unit replays the notes it has passed over when coming to this panel. One replay for a single note Note Panel, and a triple replay for the three note Note Panel.After the performance, KUMIITA Unit goes happily on its way. Repeat your favorite sounds with this panel. Choose from blue, yellow, red and green. KUMIITA Unit's stripes will glow the same color! *Touch these panels to make KUMIITA Unit change color. Now touch the Color Branch Panel and see what happens! KUMIITA Unit makes the sound of the pictured animal. Enjoy all the animal sounds! *Click to hear the sound. KUMIITA Unit plays the sound of the pictured musical instrument. When followed by a Music Note Panel, the tone will change. 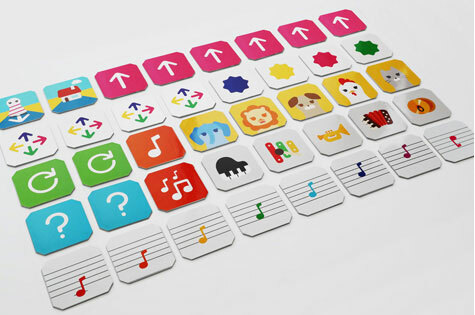 Arrange Music Note Panels for a fun performance! KUMIITA Unit plays C, D, E, F, G, A, B, C (one octave higher) notes. The notes change with the Musical Instrument Panels. 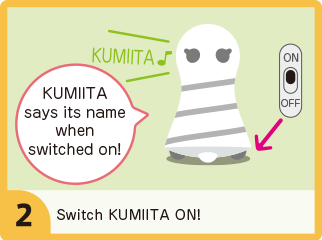 Play your own melody with KUMIITA! Go here for detailed panel explanations, fun panel arrangements and more! The basic set includes KUMIITA Unit and 40 panels (30 panel varieties). Carry Pouch to store KUMIITA Unit. Picking up afterwards is good training too! Goes with Beginner Panel Set for more ways to learn and have fun. The KUMITTA panels utilize Apollo Japan Co., Ltd.’s patented Screen Code technology. Screen Code is a technology that embeds “invisible” code in printed materials. 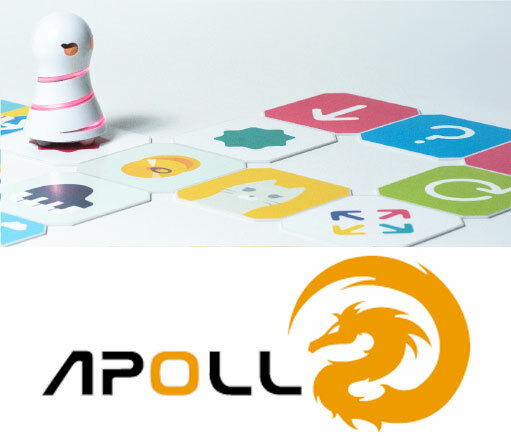 Having tested a number different code technologies, we decided to employ the Apollo Japan Screen Code for its information reading functionality, performance and because it does not interfere with the panel design. 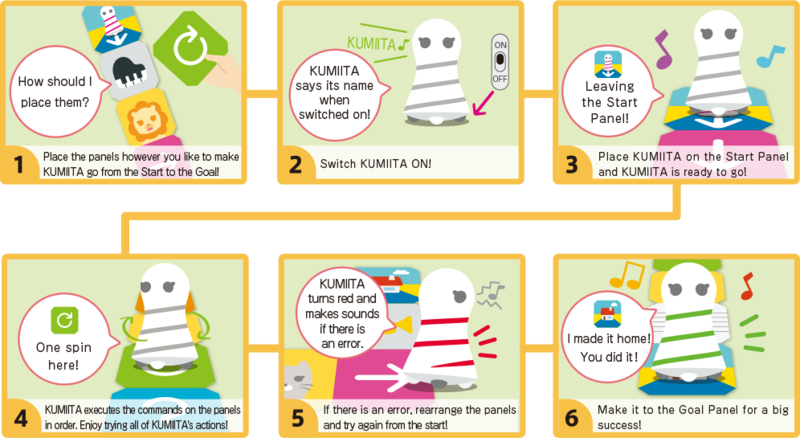 Equipped with a special reading device that reads the Screen Code on the panels in real time to execute the programs, KUMIITA is able to perform a variety of actions and expressions. Age recommendations differ for each product. Please see individual product details. Are safety standards being followed? KUMIITA passed the safety standards of the Japan Toy Association to obtain the "ST Mark" (Safety Toy Mark) certification. Product is made from materials that are safe even if licked, and food sanitation inspection was passed. What kind of batteries are needed? 4 AAA alkaline batteries (sold separately) are recommended for the KUMIITA unit. Approximately 6 hours of operation. 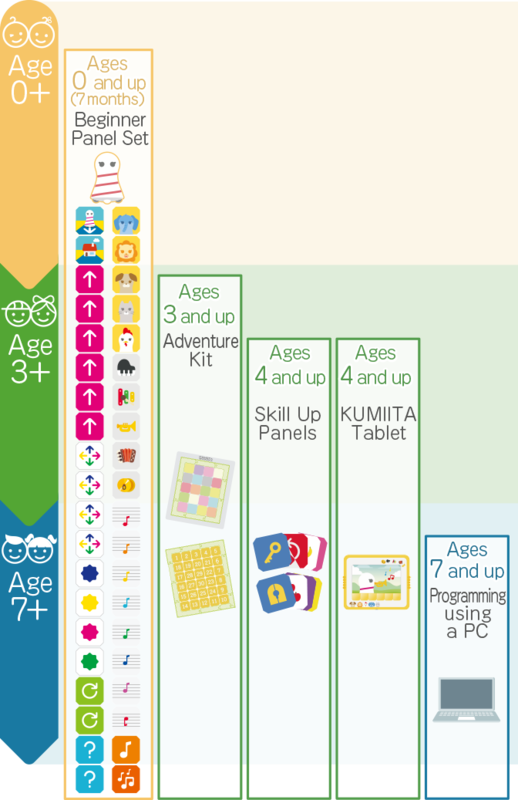 In the future, KUMIITA will grow with a series of products that will offer new learning possibilities. KUMIITA is planning and developing by ICON Corp.
©2018 ICON Corp. All Rights Reserved.